Black walnuts are a tasty treat often used for baking. These nuts can be expensive when purchased in stores. 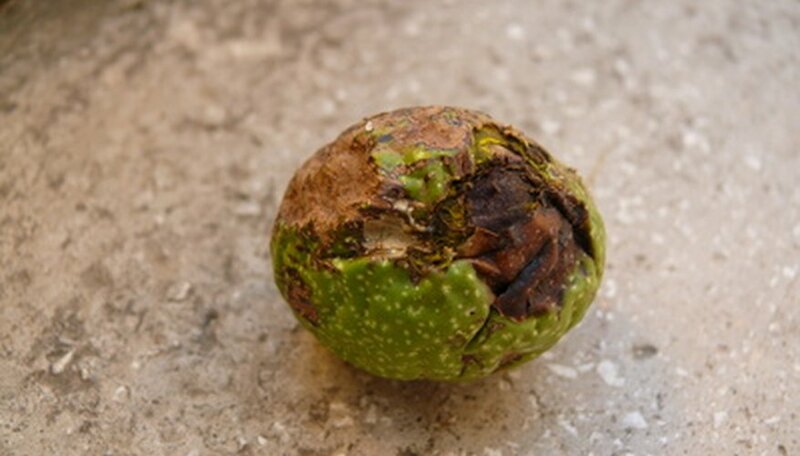 If you are fortunate enough to have a Black Walnut tree on your property, however, you can reap the rewards of growing your own black walnuts. Proper harvesting is time-consuming, but well worth the effort. Dress appropriately for this type of work. Wear a long-sleeved shirt, long pants, heavy work boots and gloves. Be sure these clothes are ones that you will not mind throwing away if walnut stain penetrates them. Pick up the walnuts that have fallen to the ground. Stomp on the walnut firmly with the heel of your boot to loosen the hull from the shell. Pick the walnut up and peel the green outer hull off the walnut. Discard the hull in a bucket to use for compost later. Place the hulled walnut into a separate clean bucket. Move the bucket of hulled walnuts to a picnic table or use a piece of plywood between two sawhorses. Lay a thick piece of clean cardboard over the surface you are working on. Dump the walnuts onto the work surface in a tall pile. Scrub each walnut gently with a clean wire brush to remove residue or any leftover pieces of hull. Place the cleaned walnuts in rows on the cardboard. Leave a slight space between each walnut as well as a border of 3 to 4 inches around the outside of the cardboard piece so you may attach squirrel netting. Move the cardboard with the cleaned walnuts on it to a sunny location. Allow the walnuts to dry in this area for three to four days. Cover the walnuts with squirrel netting to make sure they are not disturbed during the drying process. Wrap the netting securely around the walnuts, leaving 6 to 8 inches of space over them to allow air to circulate. Staple the netting to the cardboard with a staple gun or use heavy duct tape. Remove the squirrel netting from the cardboard and roll it up for reuse. Secure the netting with twine and store. Place the dried walnuts into a bucket. Discard the cardboard. Place the walnuts in a cool, dry area for five to six weeks before using. Crack the walnuts open with a hammer or nut cracker after this time to check the texture of the nut. Make sure the nut is crunchy and not rubbery. Put on gloves. Crack open the remaining walnuts. Discard the shells in a plastic trash bag. Save the meat of the nut in plastic containers or zippered storage bags and store in the freezer for up to one year.